Hacks that will make you think…Why didn’t I think of that?!? Have you ever noticed they just don’t make furniture like they used to? That’s why up cycling is so great. You get the modern day look and convenience with the olden day workmanship. It’s a perfect combination! Here’s my latest finds when it comes to upcyling. I know I can definitely benefit from these! What about you? 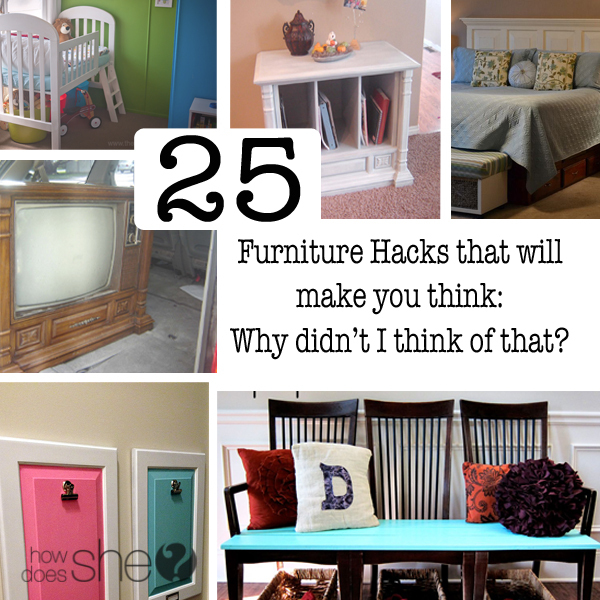 Here is a list of 25 of the greatest furniture hacks we’ve found! 1. Curbside TV to Living Room Feature. 2. Dresser turned to Entryway Table. 3. Wonder what she did with the dresser drawer from the above hack? Made a Storage Box! This is mind blowing! 4. You’ll never guess what this used to be. Chances are you already own one. It’s been turned into Garage Storage. Amazing! 5. Repurpose those old Kitchen Chairs. Great way to recycle! 6. These lockers are made from an old bookshelf! Kids love having their own place to put their stuff. Great idea! 7. Bunk bed to Coat Rack. We could always use more hooks here! 8. Small Dresser to Play Kitchen. Seriously amazing! 9. Modify a crib into a Loft Toddler Bed. 10. This dresser turned into a bench is to die for! 11. Take your old crib spring and use it as an inspiration board. 12. If you need another idea for a drawer, here’s a cute one – make an Ottoman to rest your feet! 13. Entertainment Center to a TV Console Table. So cute! 14. Turn a boring bookshelf in to a Padded Bench. Beautiful and so useful! 15. Another TV console. This time it’s turned into a Doggy Bed! 16. Dresser too big, but you still need some drawers? 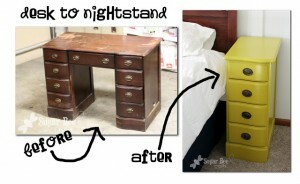 Try this- Nightstand from a desk! 17. Take an old bed and turn it into a gorgeous bench. I’ve seen people do this with cribs too! 18. If it’s bookcases you’re looking for, just take your bi-fold doors and make some! Super Cute! 19. Great way to up cycle an old door frame. Make a picture frame! 20. 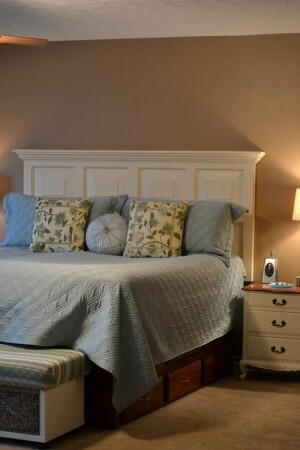 Or if you need a new headboard…. an old door will do the trick! 21. I remember one of these tables from when I was younger. Should have kept it and made a LEGO table! 22. I’ve got 2 cribs in my garage that I can’t bear to throw away…. maybe this Plate Holder is the perfect solution! 23. Convert a Dresser into a Vanity. Keep the beautiful features around to enjoy every day! 24. Cabinet Doors can be used many ways. This Artwork Display is super cute and functional! 25. And one more useful thing to make out of that old crib – A Drying Rack. I think I know what we will be making this weekend! What’s your favorite upcyling project? Let me know! Did you know toothpaste was so useful? Great post! I like all the furniture that you shared with us. All are having with the modern design and looking beautiful. Thanks.. I love the drying rack idea…now for an old crib! Love the ideas. Going to try some of these. I’m always looking for new ideas and ways to re-purpose. It is fun and rewarding. And make great one of a kind gifts. I love making old furniture into new ideas and you guys have more ideas then I could have imagined…….thank you……send me more great furniture tips please. Ah thanks! So glad you like them, there’s some pretty cool stuff here! We’ll be on the lookout for more! i am just amazed at the artistic thinking that goes into this–i see stuff at habitat all the time and i think “i wonder” and nothing comes out and then i find a site like this and i think “oh yea” now there i am wandering around at auctions wondering!!! …..:can’t BARE to throw away’????? bear! grammatical errors make me crazy! Some of these are pretty cool, but I think that people should be careful, I do not like the idea of people taking high quality vintage pieces of furniture and chopping them up. That bed that they turned into a bench looks like it was a very nice piece. I cringed when I saw that. I hear ya, Joe! I feel the same way. I especially cringe when it comes to people painting over beautiful wood. I agree with you both! Some GREAT ideas on here, but chopping up and painting a vintage desk, or bed as your said, isn’t one of them. I had a trellis made from an expandable wooden gate, the kind designed to keep babies and toddlers confined to a room or off the stairs. I no longer needed the gate after the children were older, and there were warnings about the gates being unsafe as a child’s head and neck could become lodged in an opening My handyman stretched out the gate to the desired height and fastened it onto a wooden frame to make the trellis. I LOVE your great ideas! Some of these are very funky furniture. I find most of them very beautiful! I love all these idea’s! Daughter is building this year and she loves the recycle furniture. Have several pieces here that will be great to use. Question what kind of paint you use and how many coats? Also do you spray or paint – paint and do you varnish. Hi Marilyn, thanks for your great questions. Your best bet is to click on the links of each specific project you are looking at doing. That link should take you to the correct website that explains in detail everything you’re going to need to know to do the projects. Thanks and good luck! A loft toddler bed? No thank you. These ideas are just amazing, they remind me of how creative my mother was, and the types of things she would think of. She would have enjoyed this link!!!! My mother once made a desk out of an old pump organ, I only wish we had a picture of it, it is only a memory we have!!! My daughter sent me link Furniture Hacks that will make you think and I LOVED IT!!! Would like more ideas for furniture!!! PLEASE!!! Thanks so much! You should be getting an email soon from us to confirm your subscription. Have a great day! Brenda are you currently subscribed? Please email me at [email protected] and I’ll see how I can help you! Thanks! tried to get on ur mailing list but it said it was not active at this time. So sorry about that! Watch for an email from us about your subscription. Thanks so much! Great ideas, but the ads slowed down getting through it that it made it almost not worth it. I was so excited to see my curbside tv to living room feature project showcased on this website. Thanks for the love. Very Clever! I hate throwing things away. Now you gave me some ideas. What was the Garage Organizer originally? Was it a filing cabinet minus the drawars? Yes that’s it! Pretty creative, don’t you think? I had an expandable wooden gate that I no longer needed after the children were out of the toddler stage,. In addition, there were warnings against using the gates because a child’s head could become lodged in the open spaces. So, I had my handyman stretch out the gate and fasten it to a frame he had made of 1 x 1 boards. He stripped and refinished it so that I now can use it for a trellis in my garden. I was able to get you subscribed. Watch for an email confirmation coming soon! Thanks for your support! Some of the most original furniture ideas ive seen! Love your hacks!!! In 20 what did you use UNDER the bed? I have a kingsize and would love a hack to have this. How can I see the rest I don’t have Facebook or whatever the rest it ask for to share. I don’t want it neither, but would like to see the rest of your hacks. Mailing list still not active!! I was able to get you subscribed. Watch your email for more details. Thanks! I know this was posted a long time ago but thank you for sharing my bed to bench. Even those there were some comments of disagreeing with what we did the bed was in horrible condition and it was sold right away. Some people disagree with painting wood and some don’t. to each there own I guess. Thanks again! I love everything that was repurposed. I would love to see more. Thank you. Shared it on facebook but I can’t see the rest of the funiture hacks… that stinks! I love the furniture hacks, but even after I shared the post it didn’t unlock the remaining ideas. I can only see the first seven. Your post said all I had to do was share, which I did, but I still have not seen the additional 18 DIY Furniture Hacks. Can you help? the google+ button didn’t work to share! Had to use the facebook button to view the rest of the post! Your ideas are great, I love them all, Thank you for sharing. I shared, and did not get the additional DIY furniture hacks. ????? I’m so glad to hear that! Thanks! Wonderful ideas, thanks so much. I go to thrift stores all the time. Yard sales are great also for picking up things to reuse somehow. I just signed up and was reading the 25 things you can do with a used to be! I didn’t write the list but am giving you the numbers. Hands down there were just more than one that I just thought I would never have thought of that but mu eyes have been opened! The ones I loved 1,2,17,21, and last but not least 23. You really had a lot of great ideas thanks! Thank you for sharing these!! I love up-cycling furniture and these are very inspiring ideas. Jeeze! The ads!!!! 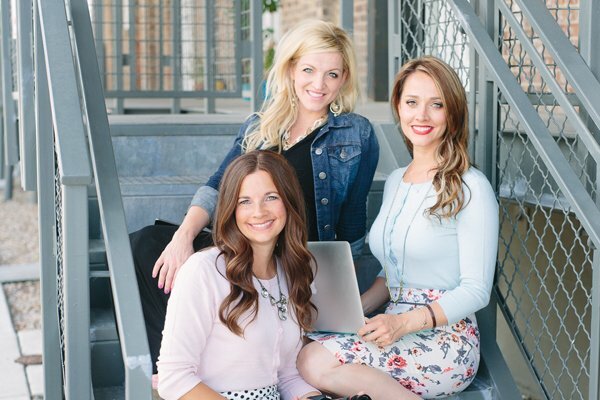 I get that you want to generate income, but who wants to wade through all of that? They are on all of the photos and clicking them off doesn’t work. More pop up in their place. What a horrible pain. Agree about the ads .. it has gotten CRAZY!! I love these!! So clever and creative. I’m going to try to look at furniture differently now. Gorgeous furniture hacks. Thanks so much! It was super fun to write! As a furniture provider we are always working to innovate new design and searching for new ideas. we know very well that people do not like old furniture designs, public demand is always so high and we are working hard to fulfill their need.